Morning fans of Middle Earth! Or is it evening? 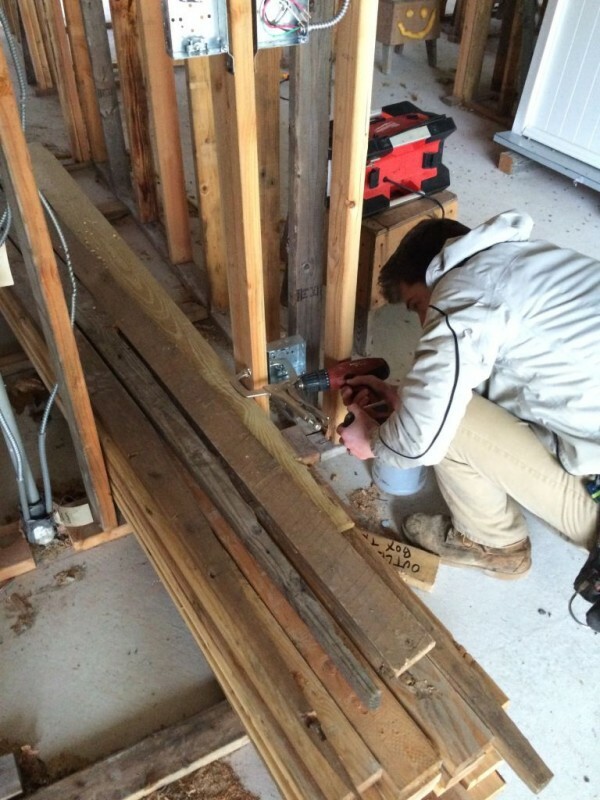 Glad you dropped by for another installment of the Hobbit Hollow Construction Blog! I just put the forging of the Rings of Power in the title because I thought it sounded good. It does have a nice “Ring” to it don’t you think? I’m going to spare you none Lord of the Rings people a round or two about the forging of the great Rings of Power. We’ll revisit that some other day. Right now I’m getting ready for the Jet game at 1 o’clock. If the Jets win they’re in the playoffs which they haven’t seen in five years. So todays game is a big deal to us Jet fans. The Editor picked up the nacho makings this morning. I’m actually a bit nervous about the game. Boy I need a new hobby or something. So I broke in son Ethan into the world of rough electrical wiring this weekend. It’s a little tricky but interesting work nonetheless. Quite a bit different than what we’ve done in the past. So we have a few issues related to rough wiring that are in fact a problem. The first of which is we haven’t finished the rough wall framing. 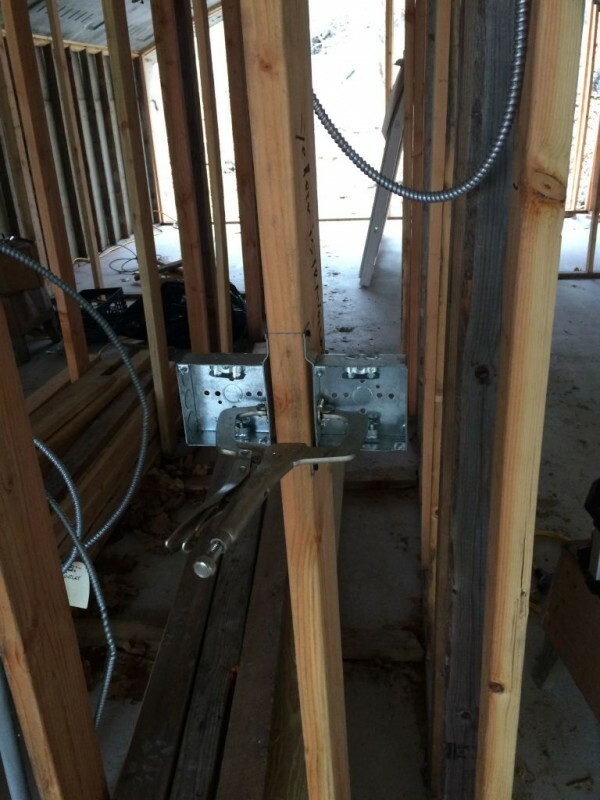 Obviously the whole front and back of the house haven’t been framed yet so none of the rough wiring can be done at these locations. So what I figured we would do is start with wiring the breakers in the panel box. Once I get Ethan set up with that I can start locating all of the boxes for the outlets and switches wherever I need to install them. So the panel in and of itself is a big job. 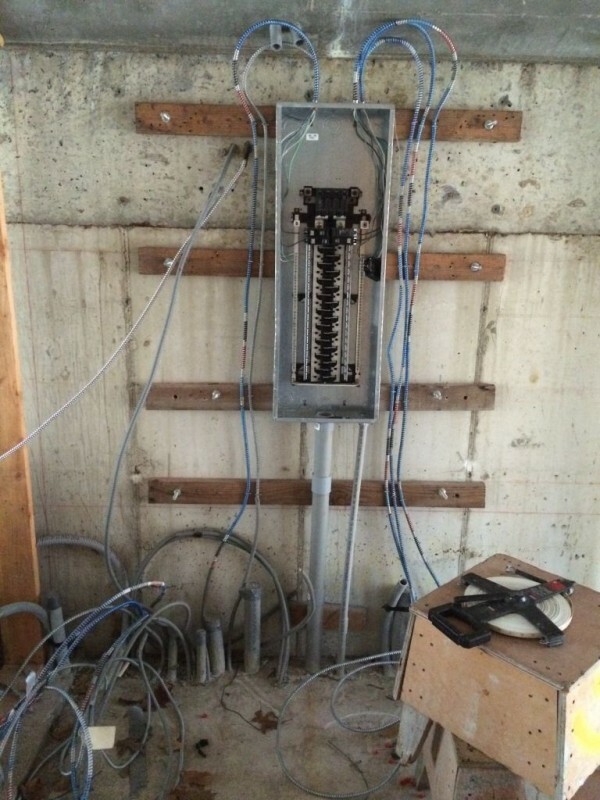 What we did if you recall is run all the circuits underneath the slab from all corners or the house over to the panel box area. This was a real score because now all we have to do is untangle this mess of wires and wire them into the box in an orderly fashion. Which is easier said than done. I mean this thing is a real spaghetti western. Check it out. Spaghetti Western over at the panel box. So the key here is to work neat and keep it organized. One wire at a time. Here’s the procedure. 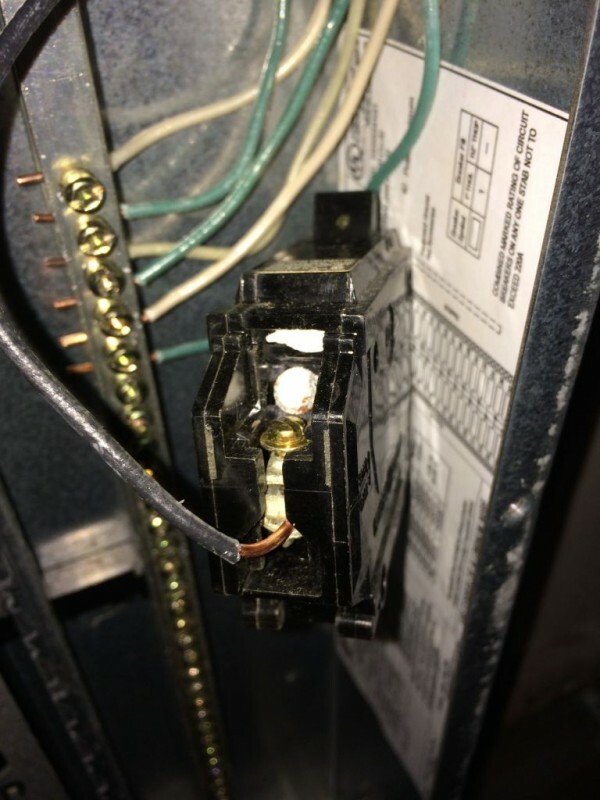 Pick up a wire on either side of the panel box closest to the panel box and staple it to the 2×4. Figure out where you want to cut the BX cable before it goes into the panel. 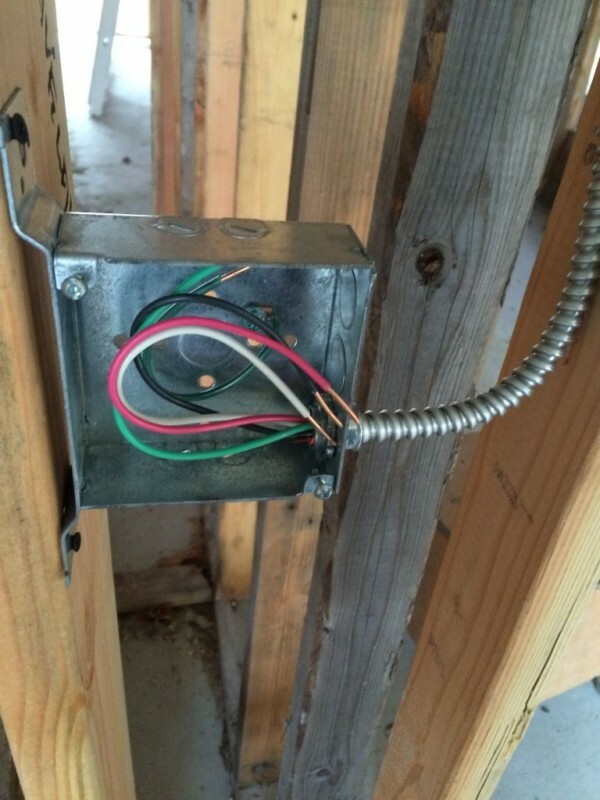 Install a red bushing and a connector to the cable and secure it to the panel box. Once this is done you connect the white and green wires to the neutral bar and the black to the breaker. 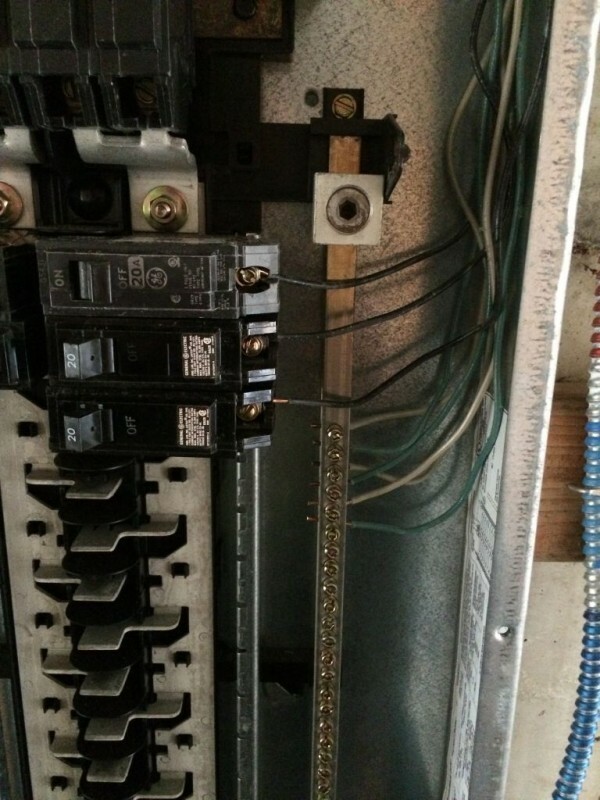 Then all you have to do is push the breaker into it’s position in the panel working from the top down. Hmmm. Probably lost a few of you along the way there. How about a picture or two to show you what we did, shall we? 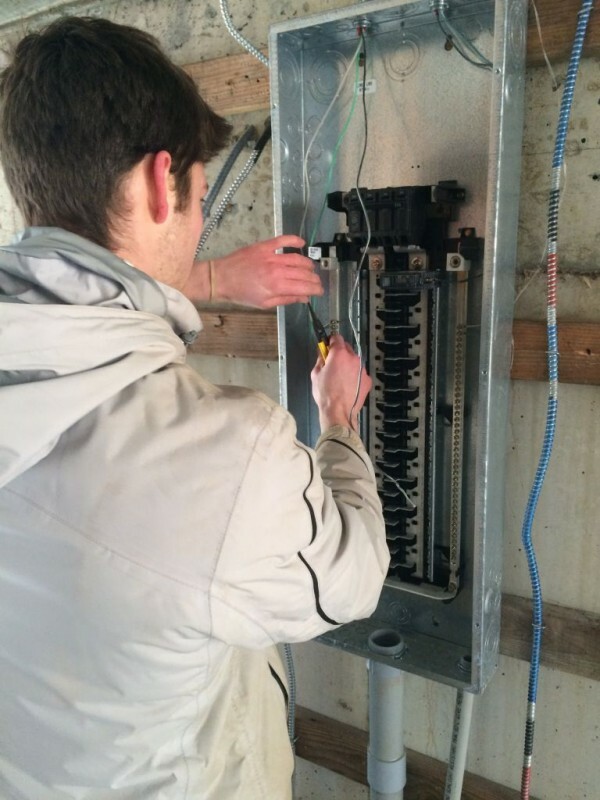 Ethan wiring the panel box. Green and white to the neutral bar. Black to the breaker. I really did a lousy job with the pictures this week and I apologize for it. I think I was a little to focused on showing Ethan how to wire the panel box. I went back to the house to measure something later so I got some better shots in after the fact. Oh yeah and my miserable Jets just lost to the lowly Buffalo Bills. It doesn’t get more depressing than that. Let’s get back to reality Jim. Football is now officially over as far as I’m concerned. Bringing the wires into the box. So one of the keys to doing a nice job is to keep everything neat and organized in the panel box as far as the wires are concerned. 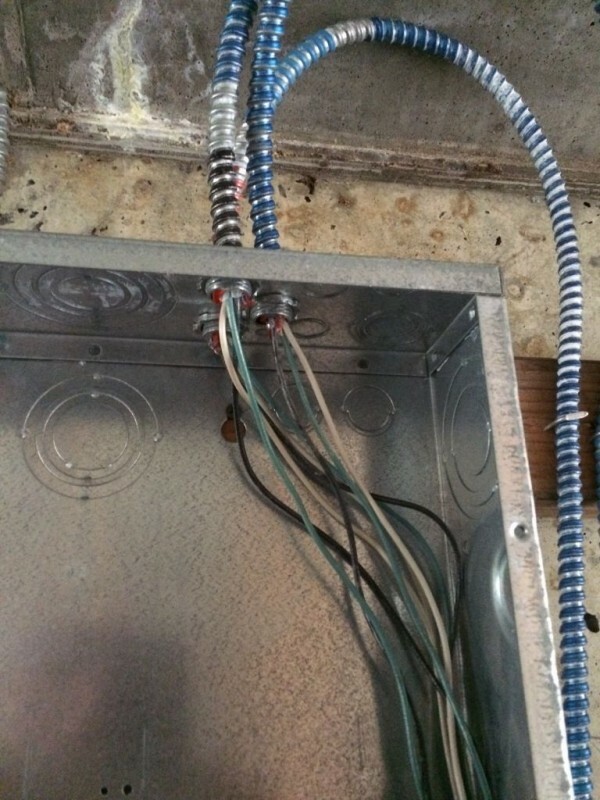 Make sure you push them into the corner so it’s easier to get the next batch of wires in. As I was saying before once Ethan got the hang of wiring the panel box I set up a means to install all the electrical boxes on the wall studs. What I usually like to do is set up a template or story pole stud that will set the height of each box at exactly the same height. One story pole for switches and one for outlets. Once I have these cut you just take the box, sit it on top of the stud, clamp the box to the stud using a c-clamp, and then secure the box to the wall stud with course thread drywall screws. A few pictures. Clamping a box to a wall stud. Here’s Ethan securing the box to a wall stud. Ethan securing an outlet box in place. Wires brought into the box and stripped so they are ready for a device. Either a switch or outlet. If you look closely at the box I installed a green grounding wire on the back of the box. Some would say this isn’t necessary because we are using armored cable that is grounded back to the panel box. I like to put it in for the devices though. I like this connection better. Anyway, we got started and we are on our way. I enjoyed Star Wars for the most part. A couple of holes here and there but I liked the new characters and the I think the story is going in a good direction.